On this page we will keep you informed of new products we are working on, show you what we can do if you would like to commission a unique model from us, and provide some modelling ideas you might like to try. The Middle Eastern range City Walls have proved to be very popular. To complete this part of the range we are going to add a bastion piece that will sit in-line with the wall and gate pieces. This will project from the line of the wall, and have a rounded end rather than a more "Vaubanesque" pointed one. We also want to look at a range Northern European models This has this has been requested several times, but we investigating what people means by this as they find it difficult to describe the specific defining features these would like. If you can't wait for our range to expand we are available for bespoke work. This has a number of advantages for you as a customer. Firstly, it will be designed to meet your exact requirements, secondly it will fit in with your figure range and finally, it will be in the colours and textures that match your existing terrain. As you can appreciate, although the materials we use are relative inexpensive, labour is the main cost. Our work is usually charged on a time and materials basis so, if you have an idea, can provide dimensions, and perhaps images of what you require, it can't hurt to enquire. It may not be as expensive as you think. 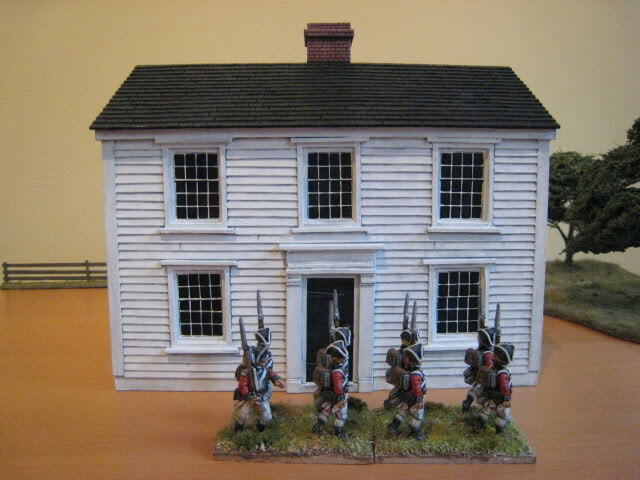 The client, a keen AWI wargamer wanted period specific buildings to match his beautifully painted figures. These weren't available from any terrain supplier so, after establishing the requirements, plans were drawn and the model was built. Other examples can be seen in the Gallery section. The main advantage to the gamer of manufactured and painted terrain is that you can concentrate on the time consuming business of getting the figures on the table. However, should you feel the urge to have a go yourself, we thought enhancing some our terrain might be an idea you would like to have a go at. Although we consider our terrain to be fantastic in its packaged form, there are things you could do to it to make it even better, by adding effects we can't achieve in the moulding process. Creating your own desert island using one of our rock packs. Adding barbed wire to our open side dugout from the Dugouts range. The rigid foam used to make our product allow the wire picket posts to be easily inserted. We sell the materials necessary for this project. Go to the Dugouts range to find them. Creating your own barbed wire obstacles. Again the materials required can be ordered from us.